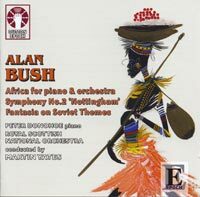 Description: Two World Premiere Recordings here: the 1972 Africa, a 25-minute work which makes use of African and European themes with the latter attempting to beat down the former through a process of struggle, lament and final victory (Bush was an anti-imperialist Communist remember) and of which this may be only the fourth-ever performance, and the 1943 Fantasia which makes use of six popular Soviet songs in what is really a member of the "comedy overture" genre, optimistic and brightly colored. The Nottingham symphony (1949) was our featured item in March of 2005 (03G001), a four-movement work of just over half an hour which evokes various aspects of the city for its 500th anniversary. The music is of an almost Sibelian economy and concentration, though with Bush's characteristic modal inflections reminding us throughout of its nationality. The richly textured slow movement with its calm surface and underlying tension is reminiscent of Delius and Vaughan Williams, while the restless and agitated scherzo - a passacaglia in perpetual motion - is an exciting 'wild ride', building a powerful climax. The extended finale, alternating passionate lyricism with extrovert celebration, brings the symphony to a rousing and optimistic conclusion. Peter Donohoe (piano), Royal Scottish National Orchestra; Martin Yates.